Japan has been developing its own launch vehicles based onvarious research and experiments. Among such launch vehicles, the H-IIA Launch Vehicle has been supporting satellite andexplorer launch missions as a mainstay large-scale launch vehicle with high reliability. The H-IIB Launch Vehicle is an powerful version of H-IIA to open the door to a new possibility for future missions including cargo transport to the International Space Station (ISS). 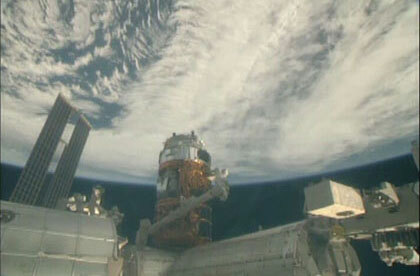 The major purpose of H-IIB is to launch the H-II Transfer Vehicle "KOUNOTORII" (HTV), a cargo transporter, to the ISS. The KOUNOTORI carries necessary daily commodities for the crew astronauts, spare parts for the ISS, experimental devices and samples, and other research items. By operating two launch vehicles, H-IIA and H-IIB, we can respond to broader launch needs. The H-IIB launch vehicle is a two-stage rocket using liquid oxygen and liquid hydrogen as propellant and has four strap-on solid rocket boosters (SRB-A) powered by polibutadiene. The H-IIB has two liquid rocket engines (LE-7A) in the first-stage, instead of one for the H-IIA. It has four SRB-As attached to the body, while the standard version of H-IIA had two SRB-As. In addition, the H-IIB's first-stage body has expanded to 5.2m in diameter from 4m of H-IIA's one. It has also extended the total length of the first stage by 1m from that of H-IIA. At the result of such enhancement, the H-IIB needs propellant 1.7 times more than the former. Clustering several engines, whose performance is already fixed, has the advantage in shortening the period and reducing the cost for its development. At the time of launching HTV, the H-IIB will use a special fairing for HTV. However, in other parts, it will take over most of the specifications and structures of on-board equipments and ground systems already used for the H-IIA. These efforts are designed to reduce development risk and cost. Moreover, it will share the launch facility with the H-IIA and be launched from Yoshinobu Launch Pad of the Tanegashima Space Center. In vacuum. Solid rocket booster's thrust is set to the maximum value.